acute lymphoblastic leukemia (ALL) which commonly affects B lymphocytes. Quinn’s only symptoms showed up as a rash and a low-grade fever. The “rash” turned out to be tiny blood vessels bursting underneath his skin. protocol was reassessed to remove one of the chemotherapy drugs to ensure he would not have any other adverse reactions to treatment. phase and lasts for 8 weeks. all the people that make up their village and who have given their time, compassion, and money to this sweet little 6-year-old boy. Quinn was unable to receive his scheduled chemo last Friday nor was he able to receive the entire treatment Tuesday. The doctors have decided to skip his final interim maintenance treatment and move directly into delayed intensification. Delayed intensification is similar to another induction and consolidation phase and lasts for 8 weeks. This phase is important because it can improve a child’s event-free survival, which is the period after treatment in which a patient does not experience cancer symptoms or recurrence. Quinn has been a trooper through the first part of his treatment. Once DI is complete he will move into the maintenance phase which will last up to 3 years. Thank you to everyone who has called, emailed, visited, or donated your time or money. It truly takes a village and ours has been amazing throughout our 5 months of turmoil. Please take a look at Quinn's photo timeline of his fight to beat leukemia. This week Quinn started his 3rd week of Interim Maintenance. His numbers are still looking very good and the upper respiratory infection that he had last week is finally starting to dissipate. His spirits are pretty high and he is still excited to see his friends at school when he is able to go. He hasn’t had many outings other than the clinic and school but he was able to check out the new Lego Movie and give a request to see the new How to Train Your Dragon movie with his buddy, Nathan this weekend. It is hard to deny the request since he has done so well throughout the course the treatment. Quinn is about half way through the first part of his 3 year treatment and he has managed to get through it all without any holds (time of stoppage during treatment) so the doctors are extremely hopeful about his prognosis. In a few weeks, Quinn will go back to a very rigorous chemotherapy schedule and could require hospital stays depending upon how his body responds to the drug cocktail associated with Delayed Intensification. The treatment will last about 6 to 8 weeks so there is a possibility that Tracy and Andrei might be able to use a helping hand with the boys, dinner, or just a run to the store. Before I wrap up this update, I wanted to extend an early birthday wish to Tracy, who will celebrate her birthday 2/21. She has been amazing to watch over the past 4 months and shown grace and presence of mind throughout this ordeal. I also want to thank the Gamerosity Organization that has chosen to honor Quinn as one of their Leukemia Heroes. 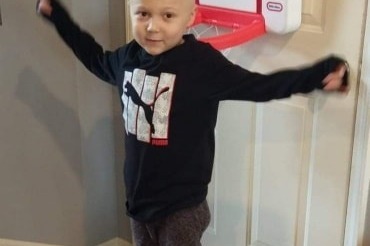 They are taking donations for him through their website and hope to get a hero package to him soon to reward his courage through his cancer journey. If you would like to donate to his hero fund, go to http://gamerosity.com/hero/quinn-cogan. Have a great week and thank you for your all that you have done for the Cogan family. Meal train for the family is setup. They could really use the help. Please sign up if you can. Today Quinn had his first outpatient chemo treatment. The treatment went off without a hitch and he had his second spinal tap to check to make sure the cells have not moved into his spinal fluid. He also had a blood test to monitor his platelet and white blood cell counts (3,330 normal is 5,000). The white blood cells and the platelets are moving in the right direction. 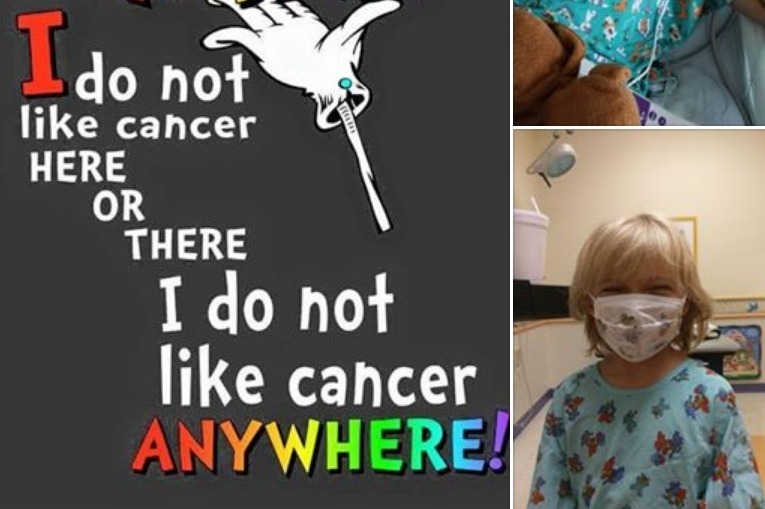 Over the next few weeks, he will receive chemo once or twice a week, as well as taking his oral medications to eradicate any other cancerous cells he might have. His immune system will be compromised so he will be house bound as I mentioned on a previous update. Tuesdays and Wednesday will be difficult days for him as the chemo will be working it's way through his little body. If he is feeling up to it, a person or two should be able to visit for a little while. The chemo takes all of his energy so he does sleep off and on for the bulk of the day. He is also extremely fragile as he is losing weight from the drugs and loss of appetite. He welcomes hugs but might be too sore to initiate them during a visit. Quinn's prognosis is pretty good considering the past 8 days have been a bit of a nightmare for him. 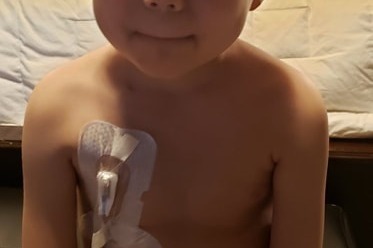 The Doctors feel fairly confident that Quinn will recover provided he does not catch any illnesses while he is immunocompromised and he does not have any adverse reactions to the medication. Most children that have ALL are able to make a full recovery. Although Quinn has a rare form of Leukemia he has a 85% chance of living a full and healthy life which is good news. Zane is a bit out of sorts but he is doing as well as can be expected as things have changed for him as well. We still play with him and make sure he gets a lot of attention as he is very aware there is something wrong with Quinn. Tracy and Andrei are doing pretty well considering the past week has been a difficult time. They are very thankful for the meals people have sent to the house, gifts that have been sent to Quinn, and the donations of time and funding that have been provided.